Thomas Hamilton brings insurance issue solutions to his clients through 40 years of nationwide coverage litigation, hands on service as Corporate Counsel for liability insurance companies, and career involvement as a legal author and educator. General Editor "Commercial & Professional Liability Insurance"
On January 1, 2012, Mr. Hamilton assumed the role Of Counsel and joined professional liability companies OMS National Insurance Company, RRG and Fortress Insurance Company as Corporate Counsel where he served until January 2014. Mr. Hamilton founded Hinshaw's national Insurance Services Practice Group and served on the firm's Executive Committee for 23 years. 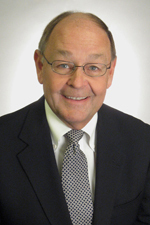 He joined Hinshaw, Culbertson, Moelmann, Hoban & Fuller (now Hinshaw & Culbertson LLP) in June 1970 upon leaving a teaching position at Indiana University. In the Fall of 2005, Mr. Hamilton completed intensive training in mediation from the faculty of Pepperdine University School of Law’s top-ranked Straus Institute for Dispute Resolution, and is a Certified Mediator in the Cook County Court-Annexed Major Case Civil Mediation Program. "Medicare Subrogation Rights 2015 and Beyond," 2014 Defense Counsel Seminar, OMS National Insurance Company, July 2014. "Introduction and Rationale of Reverse Engagement Letters," 2014 Defense Counsel Seminar, OMS National Insurance Company, July 2014. "New Issues in Claim Handling," 2012 Defense Counsel Seminar, OMS National Insurance Company, July 2012. "Storm Spotter: Early Identification and Resolution of the Complex Claim,” Hinshaw’s 2011 Insurance Services Symposium, Chicago, Illinois, October 2011. “Exposures Arising From Adjustment and Resolution of Medical Malpractice Claims,” Milliman Medical Professional Conference, Las Vegas, Nevada, June 2011. “From the Outside Looking In: Effective Management of Underlying Litigation Where Coverage is Disputed,” Hinshaw’s Annual Insurance Services Symposium, Chicago, Illinois, October 2010. “The Role of Defense Counsel and The Good Faith Claim File,” OMSNIC and Fortress Insurance Group Defense Counsel Seminar, Chicago, Illinois, July 2010. “The ‘No Prejudice’ Standard Fades into the Sunset: Prodigy Communications Corp. v. Agricultural Excess & Surplus Insurance Company and New York Marine & General Ins. Co. v. Lafarge North America,” Hinshaw’s 2009 Insurance Services Symposium, Chicago, Illinois, October 2009. “Legal E&O Coverage and the Potential Exposure from the Subprime Market Meltdown,” Chicago Bar Association, Insurance Law Committee meeting, Chicago, Illinois, March 2008. “Underwriting the Risk of Catastrophic Loss,” Hinshaw’s 2007 Insurance Services Symposium, Chicago, Illinois, May 2007. “Insurance Law—the Recent, Significant Decisions,” Hinshaw’s annual Legal Malpractice & Risk Management conference, Chicago, Illinois, March 2007. “The Very Latest in Construction Claims,” Defense Research Institute’s “Insurance Coverage and Claims Institute,” Chicago, Illinois, May 2006. “Coverage Counsel’s Report—Claim Handling Liability,” Hinshaw Breakfast Briefing, Schaumburg, Illinois, March 2006. “Welcoming Remarks,” Hinshaw’s “2006 Insurance Services Symposium: Creative Management of Claims and Coverage Disputes in a High-Risk Environment,” in Chicago, Illinois, February 2006. "Expected or Intended Conduct: Is it an Occurrence?," Defense Research Institute, Chicago, Illinois, April 2004. "Refusal to Defend—Refusal to Settle—Issues and Consequences," Defense Research Institute, Chicago, Illinois, March 2001. “The Duty to Defend and Reservation of Rights Letters,” Property Loss Research Bureau, The 1999 Claims Conference, New Orleans, Louisiana, March 1999. “Conflict of Interest: Definitions and Illinois Law,” Illinois Association of Defense Trial Counsel, January 1997. “Declaratory Judgment Actions,” Illinois State Medical Inter-Insurance Exchange, January 1995. “The CGL Policy—An Analysis and Comparison of New Claims Made and Old Occurrence Policies,” American Bar Association National Institute, Las Vegas, Nevada, March 1987. "OMS National Legal Desk Reference", OMS National Insurance Company, November 2013. “Legal E&O Coverage and the Potential Exposure from the Sub-prime Market Meltdown,” paper co-author, Chicago Bar Association, March 2008. "Attorney Liability Insurance," Attorneys Legal Liability, Illinois Institute for Continuing Legal Education (IICLE), 2002, 2005 supplement and 2007. "Excess Primary Insurer Obligations and the Rights of the Insured," Defense Counsel Journal, Vol 69. No. 3, July 2002. “Problems Arising From Additional Insureds’ Endorsements,” Defense Counsel Journal, Volume 62, No. 3, July 1995. Thomas Hamilton Authors IICLE Chapter on "Extra-Contractual Damages"
Tom Hamilton lives in Wilmette, Illinois, with his wife, Judy, who retired from Aetna Property & Casualty Company as an SIU Regional Director. His son, Ted, works in Gurnee as a Special Education Teacher where he and his wife, Melissa, raise four grandchildren.